What does The Voice have to do with Deadpool? Oh, Ryan Reynolds. Fresh off the original Deadpool making a billion bucks, he was chucking ideas at the wall to see what might stick for a sequel. Case in point: his original Deadpool 2 pitch involved a heist (so far, so normal)… for the big, red chair from reality TV show The Voice. As you can imagine, it was quickly rejected. Speaking to Jimmy Fallon on the Tonight Show, Reynolds revealed one of the very first ideas he had pitched to Fox. Words can’t quite do it justice. Ouch. And I thought my first pitches were rough. But only Ryan Reynolds could get away with pinning the hopes of a billion-dollar franchise on a joke about a piece of furniture on a TV show. The chair in question – yes, it spins – is sat on by the judges before pressing their buzzer and turning around to see the singer in action. It’s just silly enough to have worked – but I’m glad they went a different route. That joke would’ve fallen flat after a couple of rewatches. Reynolds also opened up on that cheeky Brad Pitt cameo. Spoiler: he’s in it for a split-second as The Vanisher and, as Reynolds explains it was a hard sell: “He doesn’t speak and he’s invisible. And [Fox] are like, ‘Why Brad Pitt?’ Oh, because you see him, you know, for a quarter of a second… then he unfortunately dies by electrocution.” That’s showbusiness, for you. One day you’re Brad Pitt, megastar and, the next, you’re Brad Pitt, cameo death punchline. But back to the chair. 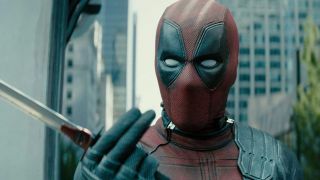 If something like that is still spinning around in Reynolds’ mind then it’s possible that Deadpool 3 could yet involve a heist of some kind. Maybe X-Force are back – now that the Deadpool 2 post-credits are out of the way – and ready to pull off a big score? For the love of God, just keep The Voice away from it. That's not everything that didn't make the cut. You can now watch the canned Deadpool 2 post-credits scene starring Baby Hitler.